If you've ever cruised and done your 3-8 times around a promenade deck, you have most likely noticed large white metal barrels on either end of the ship and what looks to be posted numbers for muster stations. These are where the crew that is not involved with the passengers lifeboats would muster to evacuate the ship if it were necessary. If you are interested, take a few minutes to look at the diagrams that are usually posted there. Many have what looks like a chute to slide down into the pictured inflated lifeboat. While in San Juan this last trip, we got to see what one looks like--well partially. 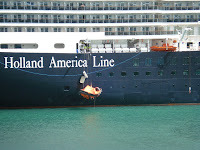 We were awaiting notification that our ship was cleared for passengers to go ashore when we noticed that the HAL ship across from us was obviously doing a Coast Guard drill for lifeboats. All of the lifeboats on the side facing us were lowered--evens and then odds (or maybe the other way around). Then we heard a pop and a clang and realized they had launched one of the inflatable lifeboats. They never lowered it all the way into the water and I don't think it ever inflated all the way. Perhaps it looks a little different when it's floating. I'm guessing it would be hard to get back in the container if it were wet. It was all quite interesting and certainly would make me want to be taking care of passengers rather than sliding down a chute into one of those things. But then, passengers aren't always such a compliant group so in an emergency that might be the scarier of the two.